Are you struggling with your achievement that doesn’t meet the success goal? Did you follow some of the famous rules in your action journey? If repeatedly you are at the same place, and can’t move towards your goal with a speed as the game it needs – you need change your direction. 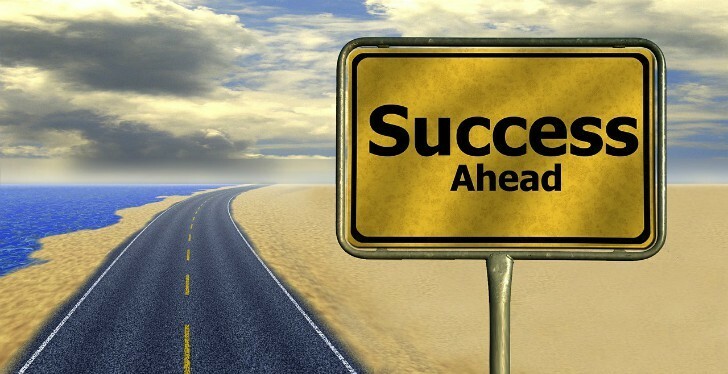 A right direction you could uncover from the famous winners who dealt their own rules of success path for the goal – and they got results as they wanted. You should discover your right dream and should be living on it with setting your right goal. You should generate your own passion on the basis of your particular image of the dream. Then, comes following some famous rules to be continued with hard work step by step – again and again patiently. 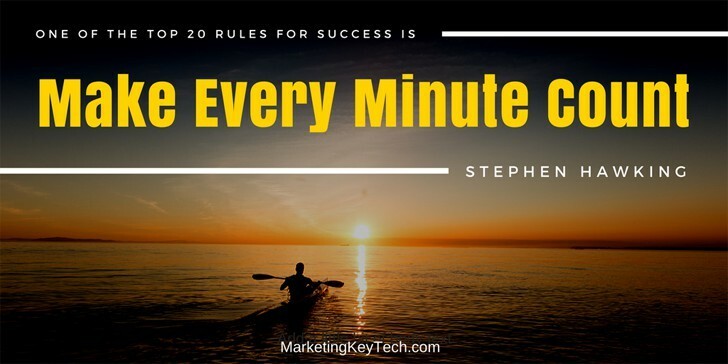 Here, let’s take a deeper look on a set of inspiring 20 rules that could surefire help you reshape your success path and taking action accordingly. In fact, every rule itself shows you the way how to go ahead and reach your goal. Here’s how each of the rules is focused briefly for your brainstorm. Dreams are all in all for success. It generates passion for working out. As much worthy a dream you live, your passion will be stronger accordingly. 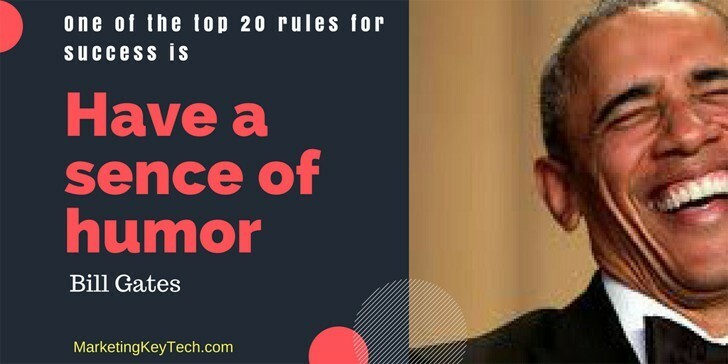 More than half dozen of successful top celebrities like Sundar Pichai, Barak Obama, Warren Buffett, Kevin O’Leary and APJ Abdul Kalam followed this rule in their success. And they love to inspire you to hold on a dream first and then follow this top most important rule in your entrepreneurial journey. While your dream is in the right order, the next crucial step is working hard. Hard work is core action to gain the desired dreams come true. 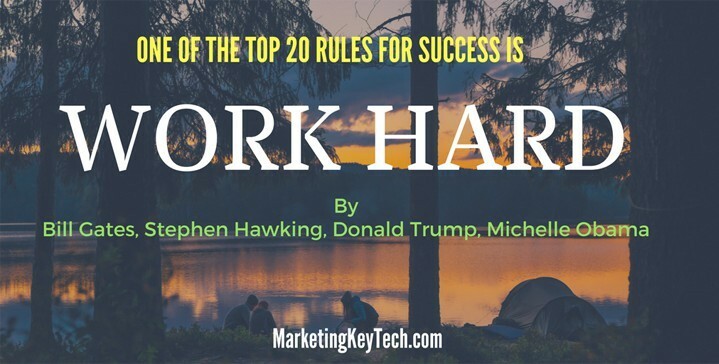 Bill Gates, Stephen Hawking, Michelle Obama and Donald Trump followed this rule in their success. The hard work helps to grasp the opportunities, removes the fear, repairs faith, and hope, increases self-belief and builds discipline. Hard work, one of the famous rules, teaches values, gives you the result and makes your own luck. You have a big dream and you’re determined to continue your hard work. Then, comes the rule ‘Never give up’ your efforts – because you are born to win. 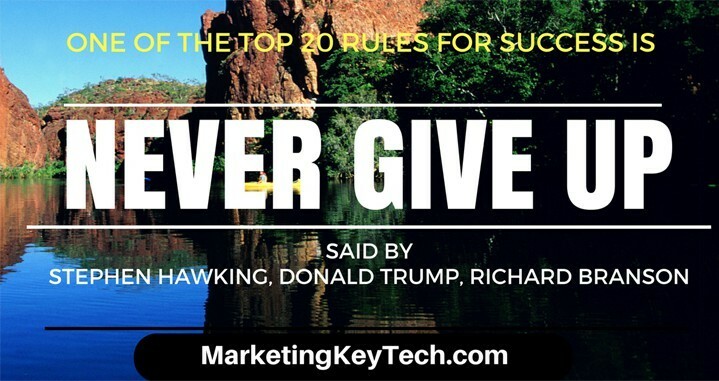 ‘Never give up’ is a popular voice around the world for the starters delivered by some famous person such as Stephen Hawking, Donald Trump, Richard Branson and so on who followed and got their outstanding success. It is an amazing mantra that helps you hold on your efforts firmly to win the goal anyhow. So, never be back-footed from your success path. 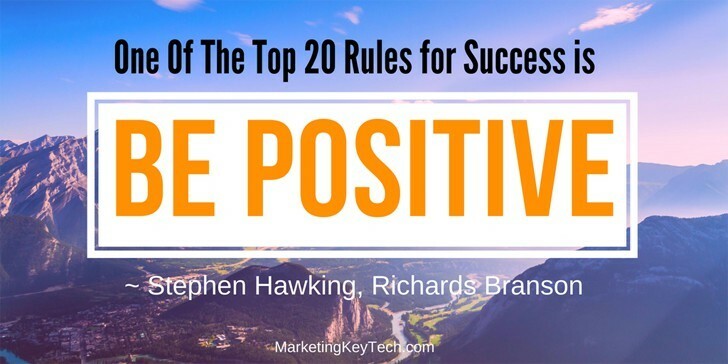 Stephen Hawking and Richard Branson urge on this famous rule “Be Positive” you should follow as they did in their success. A positive mind is essential to set the business plan whatever you require. It helps to transform a favor atmosphere in your brain that accelerates your action on the journey. So, let your success path as silky as possible bringing positivity into the present moment. Love what you do. 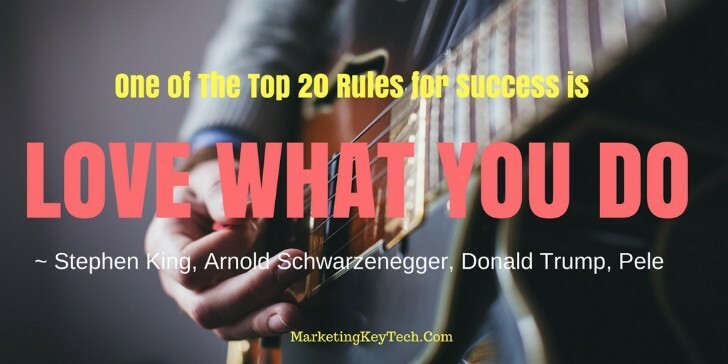 Or, do what you love – followed this rule by Stephen King, Steve Jobs, Arnold Schwarzenegger, Donald Trump, Pele, Mark Zuckerberg, Confucious and so on famous people. It is so popular in the business arena. Steve Jobs said, “The only way to do great work is to love what you do.” Science shows that love is a wonderful emotional intelligence that helps you to close any deal or finish a project successfully with two times more power than your technical efforts. This is one of the famous rules quoted by Steve Jobs carries very important values and inspiration for the starters to entrepreneurs. If you do not have keen interest to do something, you can’t grasp it. A hungry mind could help you make the deepest attention to something you do. To make a success in the effort, it is pre-condition to realize a job with your highest and deepest interest. On the other hand, “Stay Foolish” means to get ready to learn a new skill like a baby on the baby steps, or, taking a decision over an investment proactively. Both of this state of being could leverage someone to win the game successfully. The story is a powerful resource, whereas story telling is a quality job. Everyone has storytelling resource – but everyone can’t tell story powerfully that earns success. 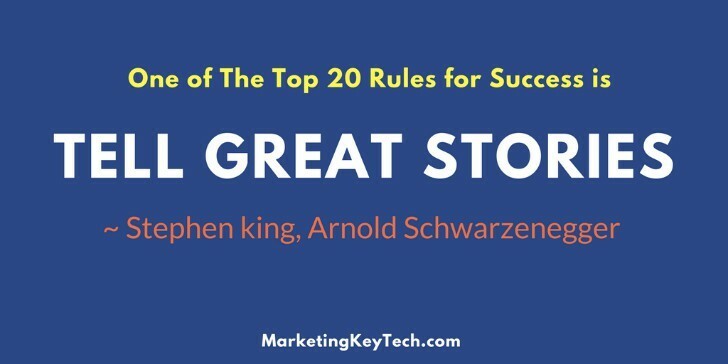 That’s why Stephen King and Schwarzenegger emphasize on the quality of telling the story and advises “Tell great stories”. Dalai Lama advises “Share funny stories”. The quality storytelling goes with emotional intelligence (EI), epic feature, crafting with optimization and so on. A profound practice could ensure the professional form of storytelling to bring the success. Reading is a great habit. If you’re habituated reading worthy books regularly, you’re a lucky one in thousands. If you are not like this, you are missing huge opportunities. The habit of reading makes a man leader on your own job and performs like an expert, though depends on your choice of the topic you read. If you read three books on the same topic, you could reach your 10% expertise level. 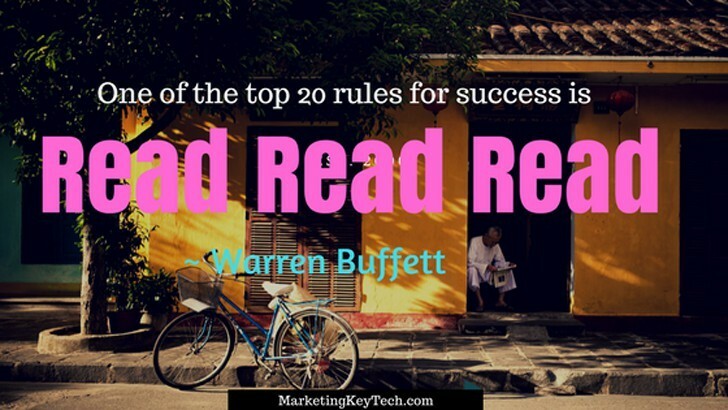 That’s why Warren Buffett emphasizes on this great rule and uttered three times in his advice – “Read, read, read”. APJ Abdul Kalam advises -“Keep reading”, and added, “Learn how to handle failure”. If you’d like to win the race, you never should stop reading for your silky smooth success path. Whatever you attempt to do in your enterprise, make it happen that solves the problem. 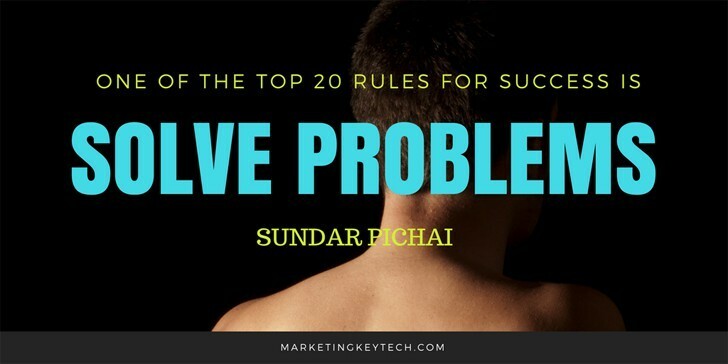 CEO of Google, Sundar Pichai followed this rule and suggests the same to all – “Solve problems”. Successful celebrity Jack Ma of Alibaba, says “Solve big problems”. It is obviously a big challenge for a starter, but not impossible. Following this famous rule, you might reach your goal of success. 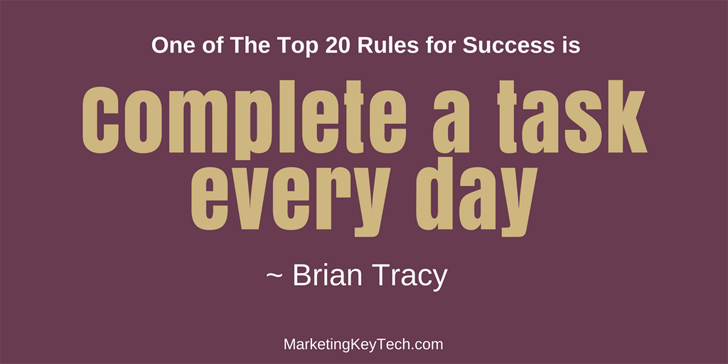 Brian Tracy followed this rule and suggests you – “Complete a task every day”. If you’re a starter and do not have a habit of fixing the least amount of work, you might follow this rule. While you target at least one task a day and march on step by step. Once soon you could discover your success in the pile of your achievement. 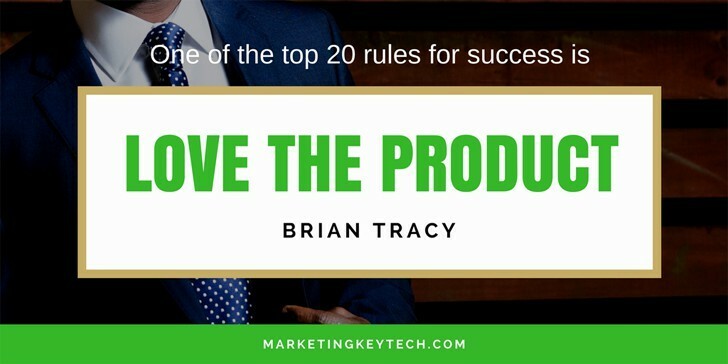 According to Brian Tracy “Love the product” is a way to move on your success journey faster. A love your product brings the passionate you create. So, love the product and love the way it made. This type of attitude brings the excellence in your action and result. The product gets excellence in quality while it comes through the love of it’s creator and makes success path. 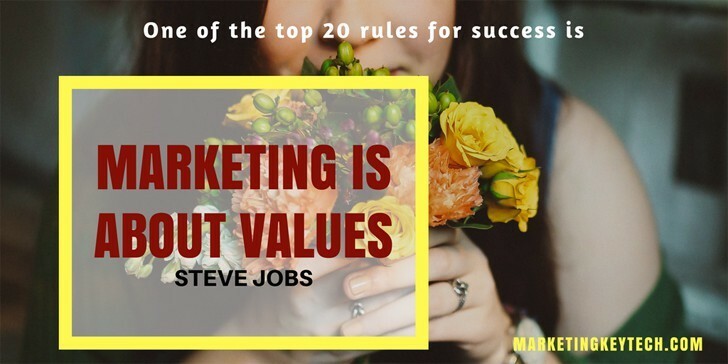 That means it is crucial to fixing the value of product what you want to offer in the market. This rule could help the company to connect their quality goods with the target buyers. It is a very important formula for the entrepreneurs in terms of their adequate product marketing. 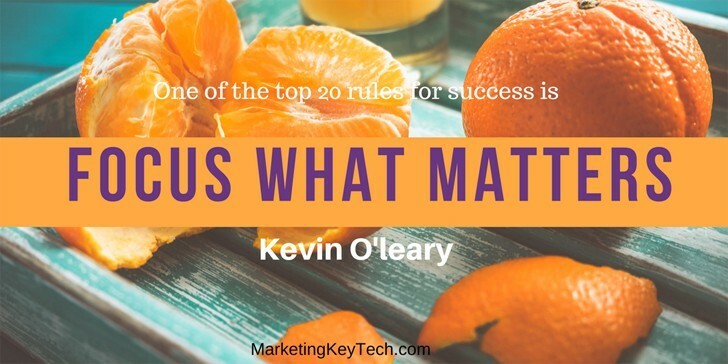 Kevin O’Leary says “Focus what matters”. That means you needn’t focus what doesn’t matter. It helps get the business what you should do for the marketing or branding. A well-optimized hybrid plan comes on your success journey following this rule. Donald Trump says “Be totally focused”. In this regard, Jack Ma, famous personality of Alibaba, emphasize the focus by “Focus on the efficiency”. Following this way, you could find the list what you need to do for the success. 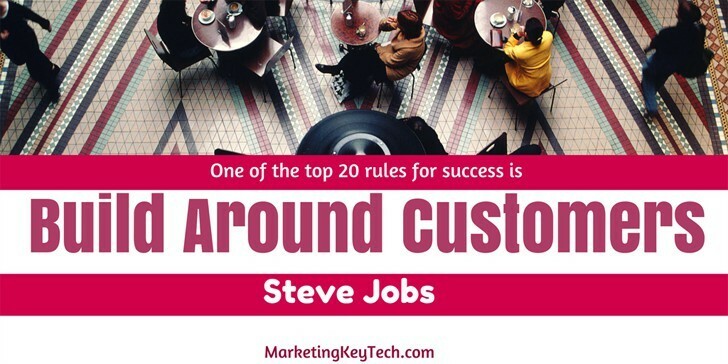 One of the famous quotes of Steve Jobs is “Build around customers”. Your business means your product or services. Now the days, it is far away to build an epic brand. Rather, it is best to fix the location where are your customers and make the product around them. This rule shows the way to build your business around your customers, not audience. To make it happen, you’ll have to look for your customers, capture them, get feedback, integrate your product in the market, pick out the data from market and use the powerful design in the sales funnel. A worthy quote “Make every minute count” becomes a famous rule of worthy life generated by Stephen Hawking. It delivers a profound thought that you should pay every minute that earns higher values. Making every minute countable, you’ll have to cost your time for the rich value tasks. Hawking feels, a man could not find back a time that passed, and you do not have the chance to rebirth for the gone opportunities. He added more “Challenge you”. So, it will be panic to waste time, need pay for the higher values. This rule could help you to move faster at your goal of success if you really follow on. Competition is a natural being in business. 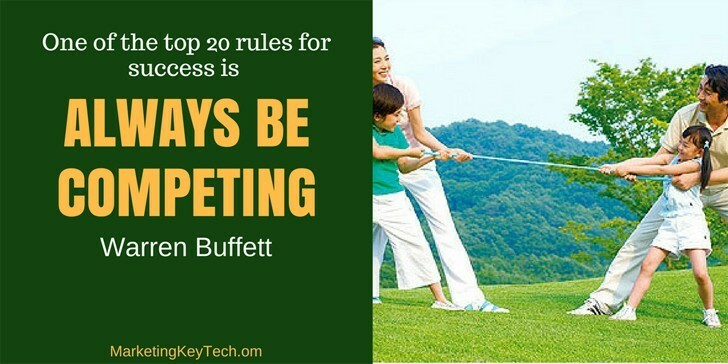 Warren Buffett followed this rule and suggests you – ‘always be competing’. Competency is a nature of business bitterly true key issue to win the business game. Warren Buffett advises you to make it being habituated in daily growth hacks. Your competitor analysis could help you how much you need to play the role with this famous rule of your crucial business. 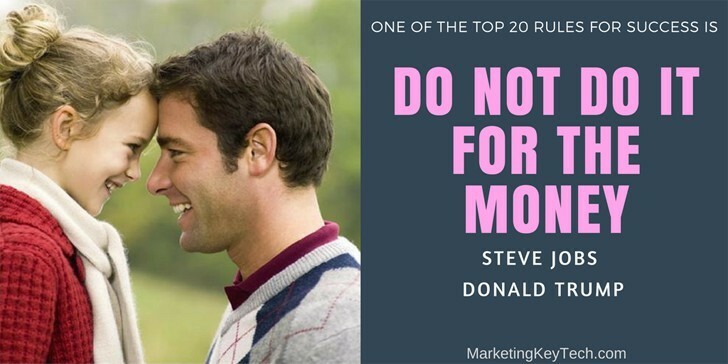 It is one of the great rules -“Do not do it for the money”. Most of the people set their action in a worthy plan on the basis of targeting money and can’t reach the success goal. It is wrong. 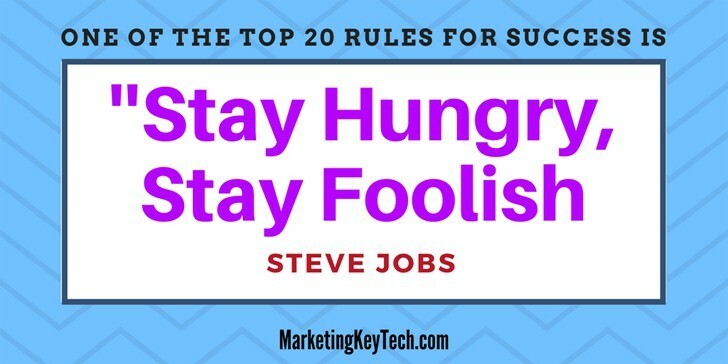 Steve Jobs and Donald Trump emphasized on this rule to accelerate the success journey that reaches to the goal. Because there are many reasons a man shouldn’t force on a worthless rule that doesn’t bear any spirit to accelerate the game. You should do it for own passion, not money. A profound passion generates an excellent product that generates money itself. You can do what you want – believe in yourself. Oprah Winfrey and Donald Trump followed this rule in their success. JK Rowling advises ‘Believe’. Jack Ma suggests, ‘Believe in your philosophy’. They are now in their position following this famous rule. In fact, nothing will work in your system, if you don’t trust in it. Nobody wants to fail. But everybody can’t make a belief in his work as much as it needs to be taken. So, believe in yourself that the change is possible to be done by you. A humor comes from a worthy jock. The sense of humor has two wings – creator and receiver. A creator can able to generate a worthy humor while he has a worthy sense of humor as well. Bill Gates suggests entrepreneurs need to “Have a sense of humor”. Stephen Hawking urges “Maintain a sense of humor”. Jack Ma says, “Enjoy your life”. Kevin O’Leary and Barak Obama suggested, “Have fun”. These quotes all are about same – have a sense of humor. This is one of the amusing famous rules of your life for refueling or recharging your stamina as well as leveraging your success. Be a lifelong leader. Who is a leader? In fact, everyone is a leader alone for his own interest. But very some of them are fit as a social or business leader can harvest success. 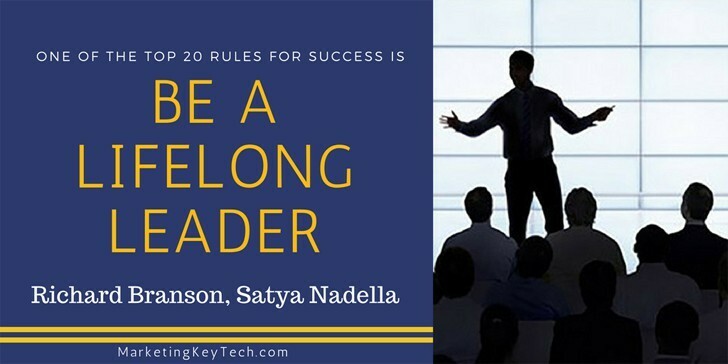 Microsoft CEO, Satya Nadella and English business magnate Richard Branson followed the rule, and suggest you to “be a lifelong leader”. A leader used to follow how to be aware of own, others, society and can able to manage the whole adequately to influence the society or community. You love to have a glorious success in business or life. But the success is not located in a comfort zone. You’ll have to pay time, efforts, money, intelligence, sacrifice, study, research, action, and so on – all are under a comprehensive set of famous rules and plan. 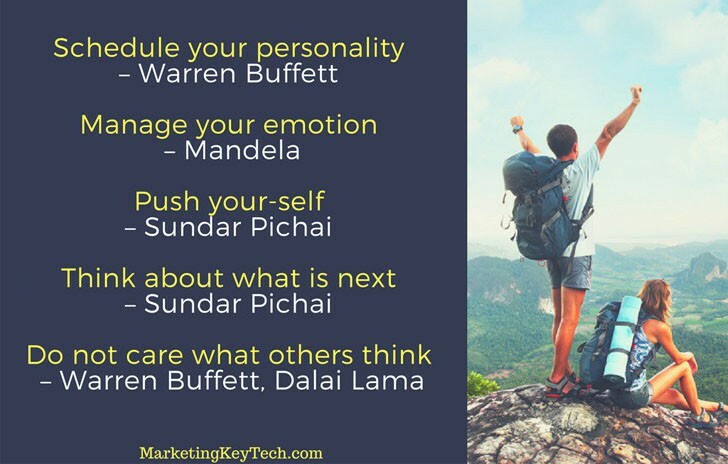 You might set the final words using some rules by Warren Buffett, Mandela, Sundar Pichai and Dalai Lama as shown in the image above. Schedule your personality with the above 20 famous rules. Manage your emotion and always push yourself on the right order of the rules. Think about what is next after finishing each one. Go step by step. In this regard, never care what others think. Believe – success is ahead of you. 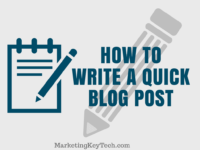 Didn't yet start a blog? You might secure a brandworthy fabulous domain name with Namecheap's free WhoisGuard. Their prompt support, and newbie-friendly cooperation is impressive! 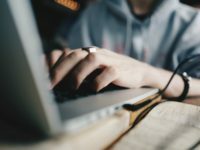 Let your blogging business be sprouted in a profound care. As a success has many paths, to uncover your hidden gem in your ability, a book of a genius writer can show you the priceless ways. If you’d like to read the new posts, you might subscribe to our blog. What is the best rule of these 20s? Or you do follow but I missed? 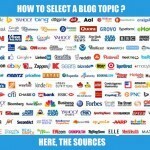 You might share to enrich our actionable knowledge.